We woke up early this morning, before our alarm went off. We went downstairs to eat breakfast – the buffet was well stocked, again on par with the Mandarin Oriental in KL. In addition to all of the regular fruits, there were large bowls of blackberries and raspberries as well. There were about 20 different bread choices, an omelet bar, and several different kinds of fruit juices. On the drive over to the airport Justin noticed many more interesting palm trees. 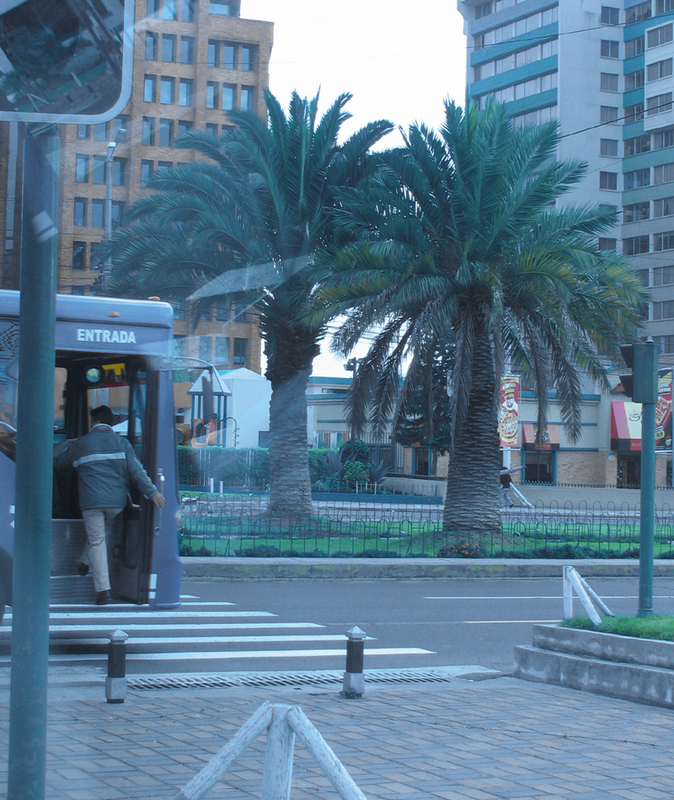 There were entire boulevards lined with Chilean Wine Palms, some sidewalks lined with Parajubaeas, and several other interesting trees and shrubs. The airport itself was hectic. 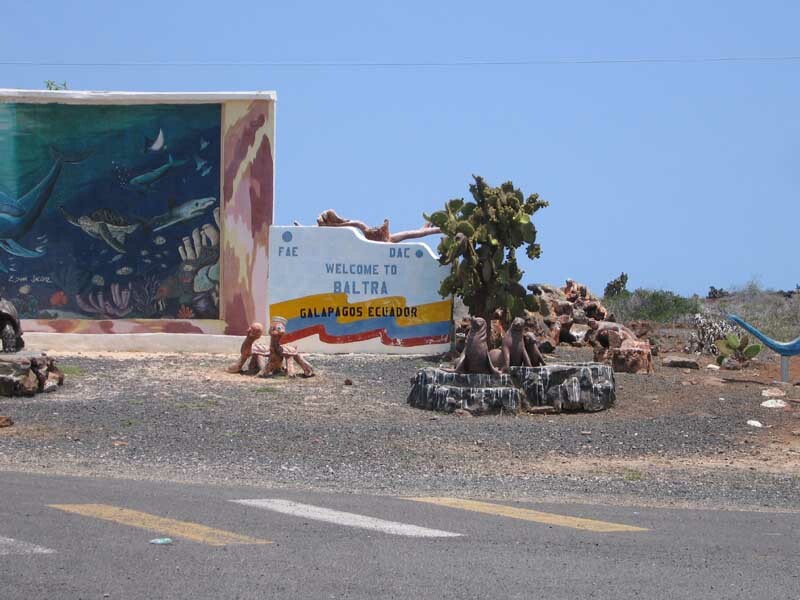 While the domestic portion of the airport is very small, many of the flights are to Baltra in the Galapagos, and thus there are tour operators and tour groups everywhere. 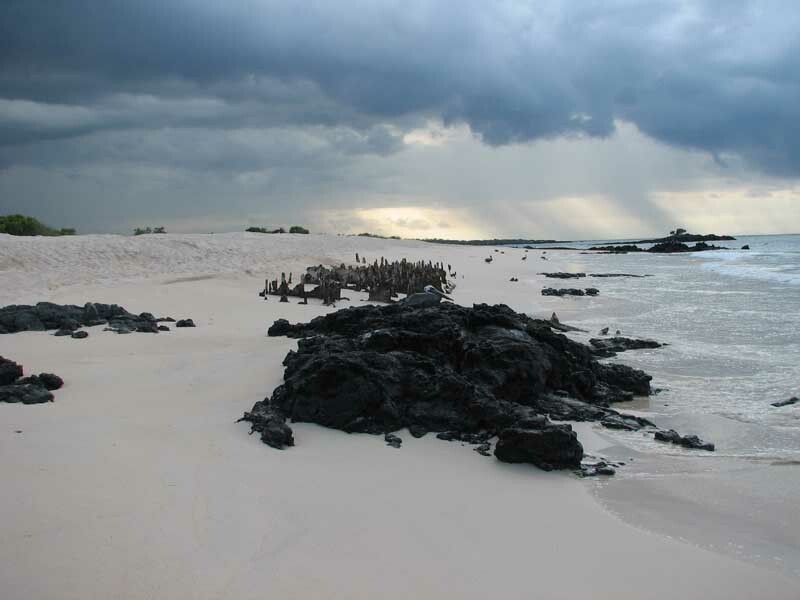 There's also an additional check on bags to make sure that no fresh fruit, insects, or other living beings are accidentally brought to the Galapagos. All of our stuff got whisked through, because the people we were with knew what they were doing. We have no idea how long it would have taken us ourselves. When we got on the plane, we noticed that there were people in our seats. We pointed this out to a flight attendant, who told them they would have to move to their correct seats. One of the men got up, but the other man just shook his head and indicated that he was not going to move. After an exchange (in Spanish, so we don't know what was said) he got up, but he didn't look happy about it. We sat down, and fortunately, Crystal had her purse this time. The flight to Guayaquil was short and uneventful. We landed, and were told we would need to stay on the plane, and that we could not use any electronic devices, like our iPods. The passengers who were disembarking in Guayaquil got off the plane, and we waited. And waited. The ground crew started refueling the plane, and a crew came on to pick up the trash. We still waited. The people sitting in the row behind us were discussing everything under the sun – ailments they used to have, places they used to live, their outlooks on life, they even starting reading the travel brochure to each other, which had on the verge of a breakdown. To make it all the worse, we couldn't drown out the conversation with our iPods. So we waited, and waited some more. All told, we were sitting on the ground for over an hour. Finally, they started to let people board, and after a little over an hour, we were on our way to Isla Baltra. 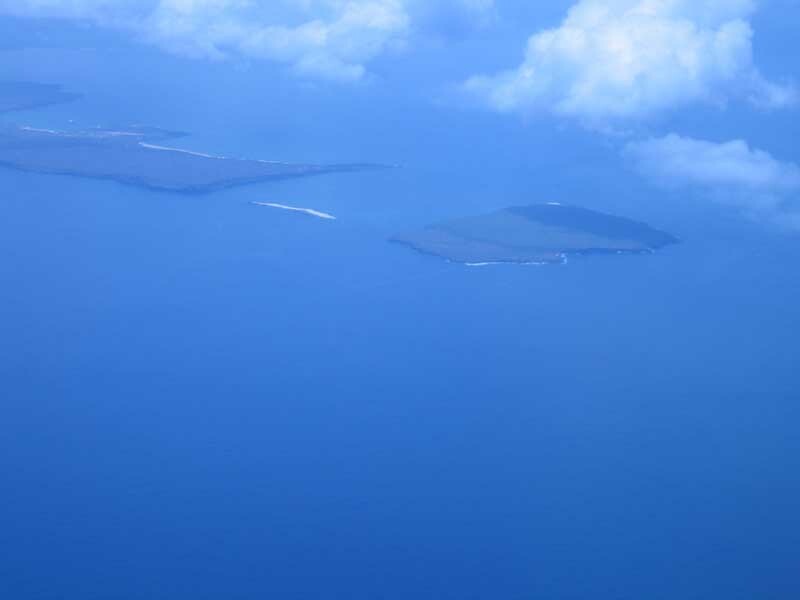 Baltra wasn't as far away as we thought – the flight was about two hours and fifteen minutes. At the airport, we were greeted by employees of the Eclipse. We sat around for a bit, then we all got on a bus that took us down to the southern shore of Baltra where we were to board the boat. 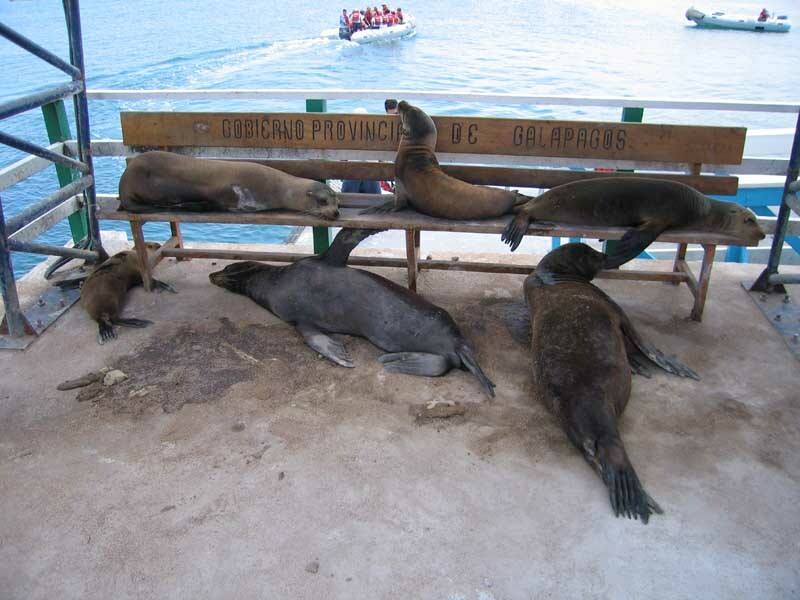 We were greeted by a bunch of sea lions who were hanging out on the waiting area benches. There were a bunch of pangas (dinghys) that could take about 10-12 people at a time from the shore to the Eclipse. We had our carry-ons with us, and Justin decided it would be a good idea to take our small camera out of its bag and put it in a different one so that both cameras wouldn't be in the same bag, in case of accident. As he took the camera out of the bag, however, the camera slipped out of his hand, bounced around on the concrete, and came to a rest with 49% of it hanging over the ledge with the ocean below. Hopefully that's the closest we'll come to losing one of our cameras. As it turned out, the panga ride was a piece of cake, and there was no cause for concern. 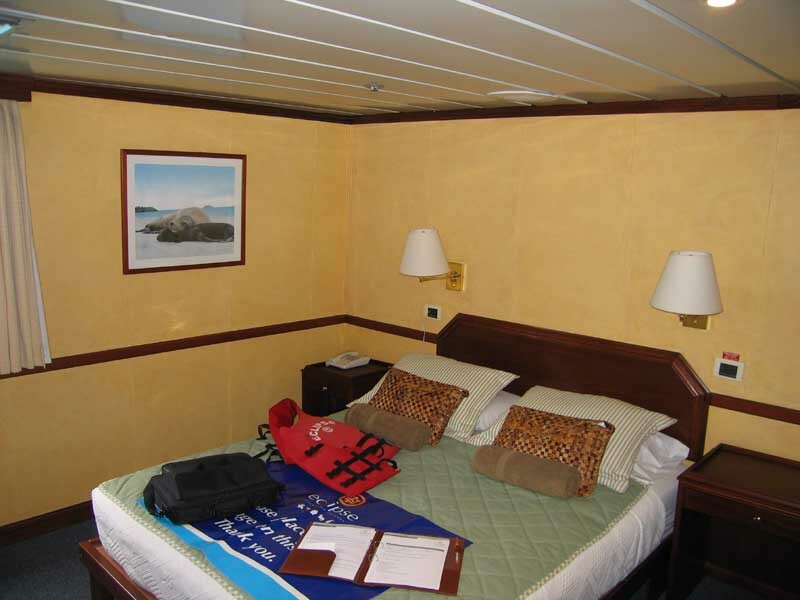 On board, they had a welcome talk to tell us about the boat, the crew, safety issues to be aware of, etc. This talk went forever, and while certainly necessary, we were among many who couldn't wait to get out of there. We had a very late lunch after the talk, and then got ready for our first excursion. 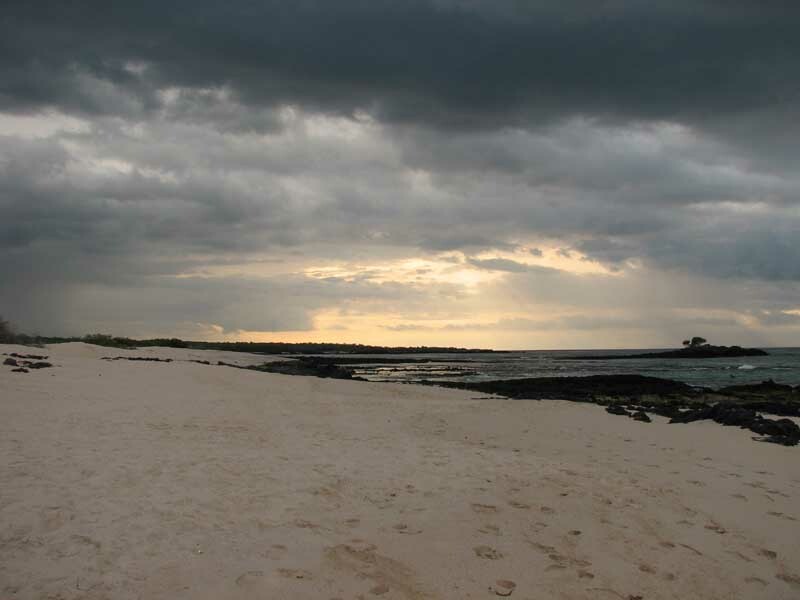 We went to Las Bachas Beach on the island of Santa Cruz. We walked slowly along the coast, checking out Pelicans, Blue Herons, Blue-footed boobies, lava gulls, some frigate birds, Sally Lightfoot Crabs and marine iguanas. We also walked to a small lagoon that had two flamingos. We walked back to the beach where we landed and went out into the ocean. The water is very warm – close to 85 degrees. Wading in the water was nice enough, but the whole time there were pelicans and blue-footed boobies dive bombing into the water to grab fish. We must have watched them for close to half an hour, and it never got old. Boobies come into the water directly perpendicular, at a speed of close to 30 miles an hour. Back on the boat, there was a talk on what we should expect the next day. We had dinner with two very nice couples, one from Canada and one from Tucson . Both of them were independent travelers as opposed to members of the large Abercrombie & Kent group that had been at the Swissotel the night before and in our area of the plane. People in that group, so far as we could tell, were in their own little clique and we did not understand their sense of humor.